Board index ‹ Other Stuff ‹ General Chat ‹ Sometimes where there is hope, there is life ! Sometimes where there is hope, there is life ! Well RCZ'ers, some times there is more to life than cars - did I just say that, well yes I did. Now after that blasphemy another not so well know fact is I keep and breed some rare tropical fish all from the mighty Amazon and it's tributaries in South America. Some of these fish are on the endangered list and it is illegal to export from S.America and some are nearly there, so it is imperative to help these fish and their survival. One way is to try to breed them and swap / trade etc with other breeders and maybe even sell back to aquatic shops in the country, this way they don't need to purchase them or get fishermen to catch them and send them half way round the world. So what you may say? well of course you can say whatever you like, some like cuddly Koala bears, some elephants, or even jaguars, lions, leopards and tigers and even rhino's. Well aswell as some of them, I like to do my bit with these fishes I keep and breed. As mentioned on another thread recently I have at last count forty, 40 fish tanks !! yes you read that right 40. As some of you know I have just come back from a trip to Italy in the car, and my fish needed some extra care when I came back ( don't worry I had someone feeding them whilst I was away ) and this is where the story and headline starts. I was cleaning one of my larger tanks and extracting the fish from their caves, separating them and then cleaning out the tank and emptying the water to refill, this is a huge task and not one I relish. Whilst cleaning the tank and hand full of gravel, I noted that I had some eggs in my hand, bugger I thought that's them dead - ( in the wild the fish I keep dig little caves in the bank or make residence in an old rotting log, when Mr fish is ready he lets a Miss fish into his cave, he then traps her until she has given him what he wants !! then he kicks her out. from that moment on he is the carer for the eggs and further down the line the fry that hatch, once he thinks they are big enough he kicks them out too. Sometimes if he thinks the eggs are bad he ejects them from the cave or he eats them, nice dad LOL. 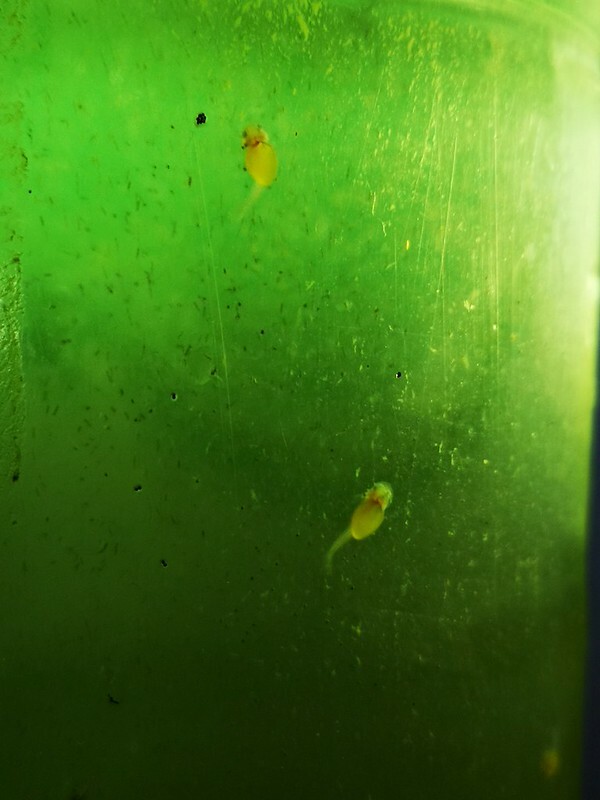 Once the eggs are ejected from the cave and away from the dad, they will not hatch as it is near impossible to give them the care what dad gives them in his cave ) That is more often than not the case and upto now out of all the eggs that I have found outside of the cave, I have only had three fish hatch and they died. 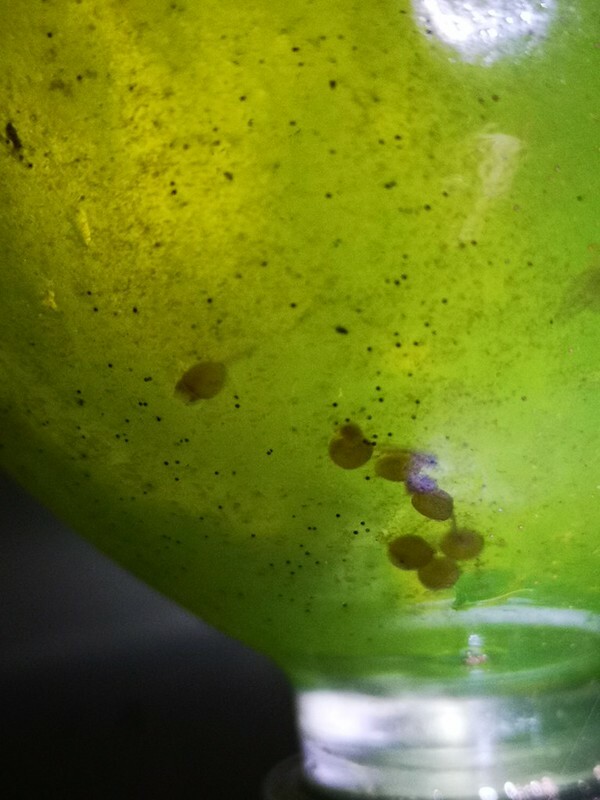 Anyway I have found eggs previously and as said they are doomed without dad, but neverless I thought I'm going to try to hatch these, so I put them in an upside down pop bottle which I use for hatching brine shrimp to feed my fish. I then added some anti-fungus treatment ( the reason the water is green ) and turned on the air to circulate the mixture and fan the eggs. 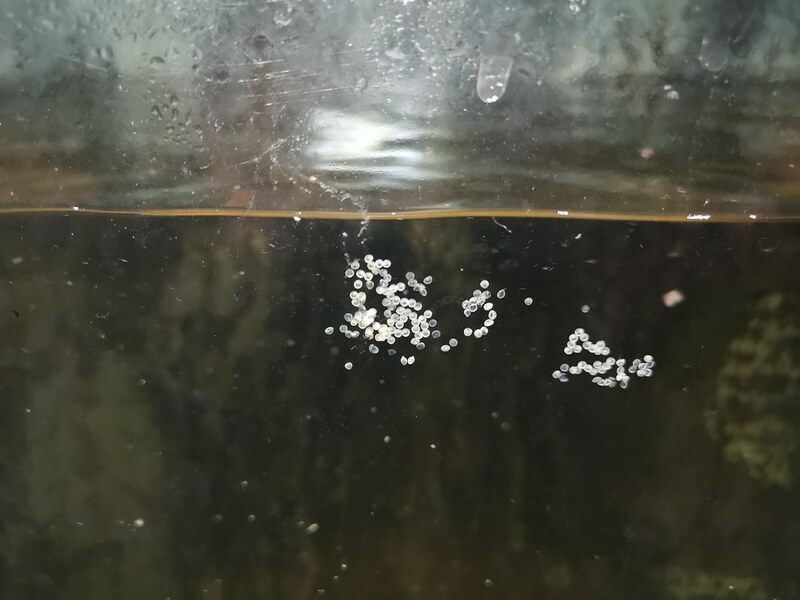 Today to my surprise, many of them have hatched as you can see here in the following pictures. 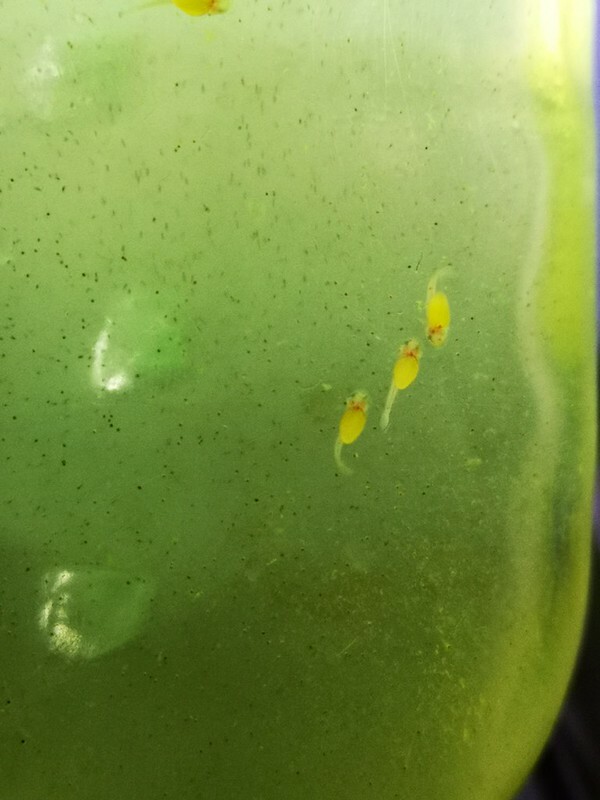 There are still eggs in the bottle but if you look closely you can see little fish with huge yolk sacks ( they will eat from these for the next 3 -4 days and they are in fact the newborn fishes stomach ) once they have depleted the yolk sacks, they will be ready to take small food, which is another challenge ! This ends my story, if you want to see how the fish grow on into adulthood, just say and I will show you Z'ers their progress. On a foot note, I cleaned another tank the day before this one and in the process changed 50% of the water for cooler clean water. 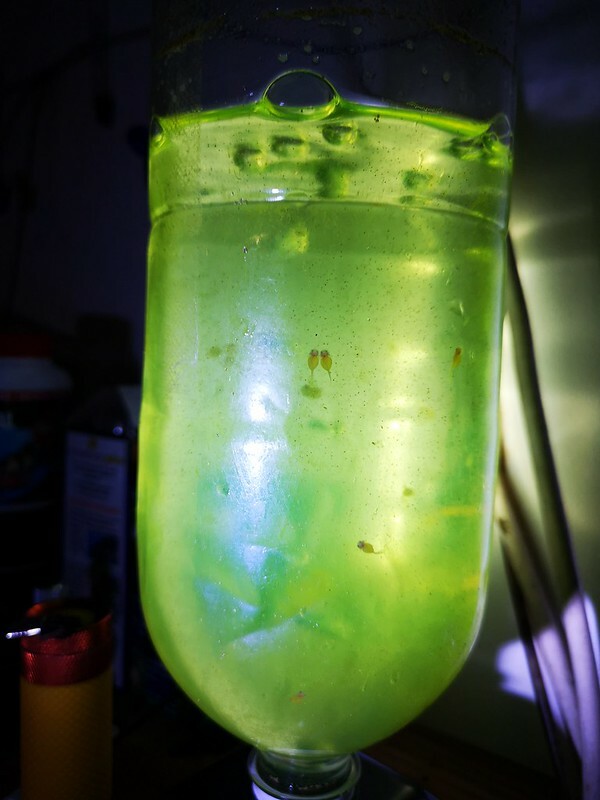 This stimulates some fish into breeding as they sense the cooler water as the onset of the rainy season and fresh rain water running from the Andes. 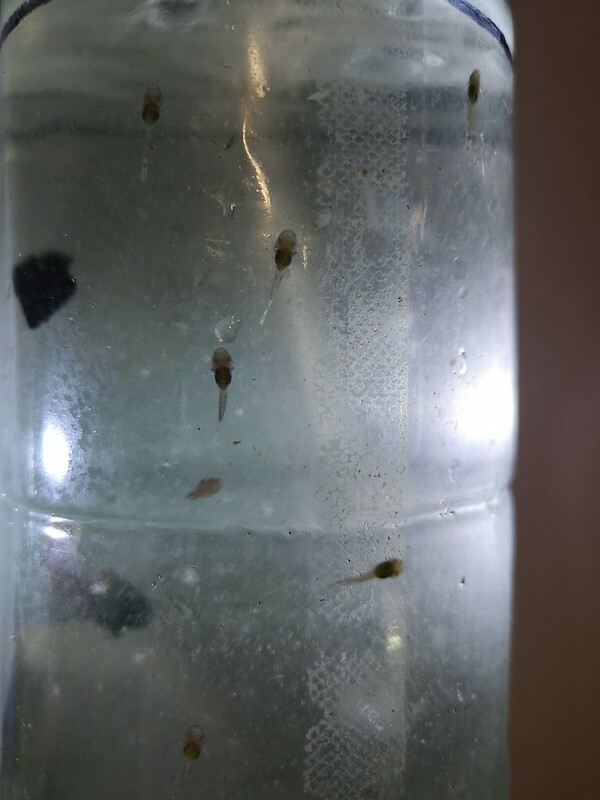 This is a natural trigger for many fishes, as this denotes the rainy season and the fact there will be food in abundance for the fry to aid their survival. 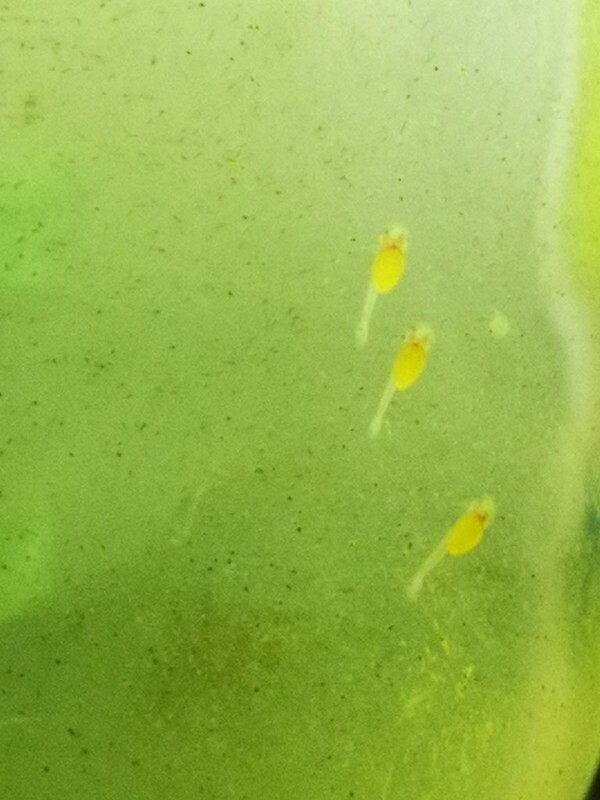 Anyway the fishes in that tank laid eggs on the glass surface..... I have as yet not removed these ( a different kind of fish ) but will in a days time. Anyway I have bored you senseless so for the few who are still awake, here is the pictures, not the best because from my mobile phone with a torch in my mouth !!! Re: Sometimes where there is hope, there is life ! "La Gata Negra" 2.0 HDI 2014 Swiss spec fully loaded. "Bus" 7 seat 5008 1.6HDI 2014. "Purple People Eater" 108 1.2 PureTech 2016 Top fully loaded. "Animal" Linhai 300 4x4 ATV 2008. Glad you liked it Stewie, just something different I know it's not everyone's cup of tea but some may find it a little interesting. Yes, Betta Splendens giving them their scientific name, a beautifully colourful fish are bubble nest builders and they are a totally different "" kettle of fish "" ha ha. Cheers and thanks RCZ-R for the thumbs up, keeping the if you like thumbs up button working !! 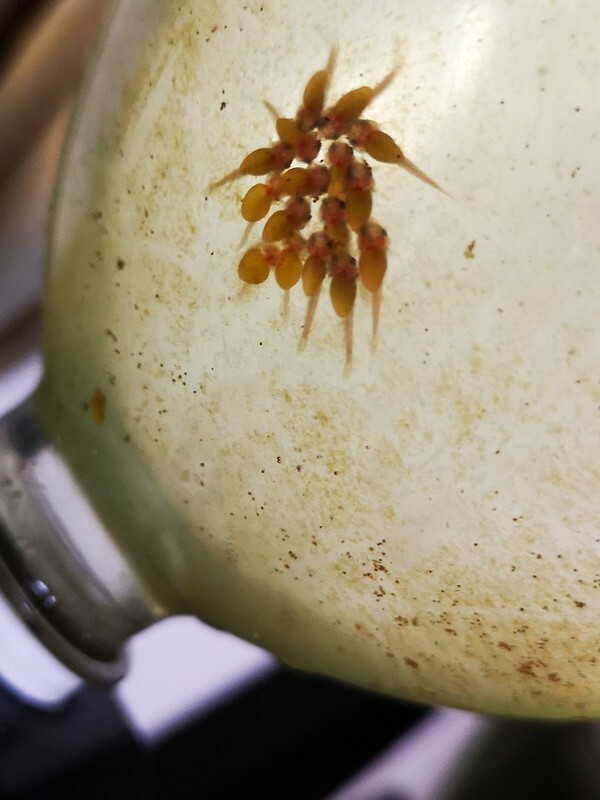 thought I'd just show you how these little fella's are doing and some other fishy goings on ! 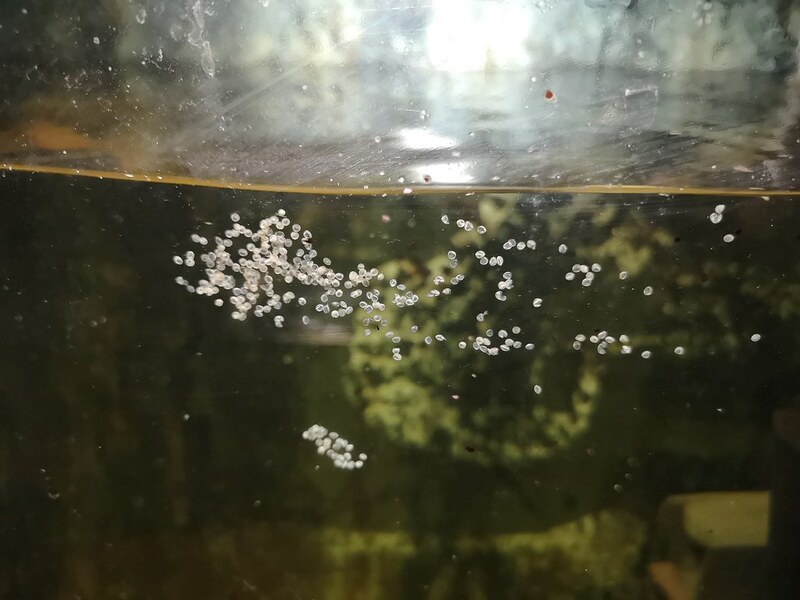 the following picture is at four days old and you can see now that the yolks have gone and they will now be ready to take food for the first time. 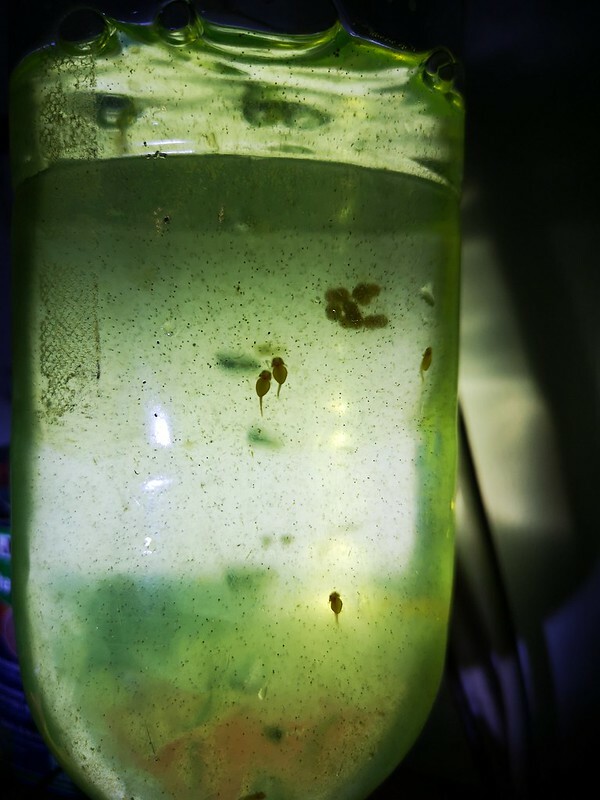 can you see the shape of the little fishes in the bottle, they resemble these? 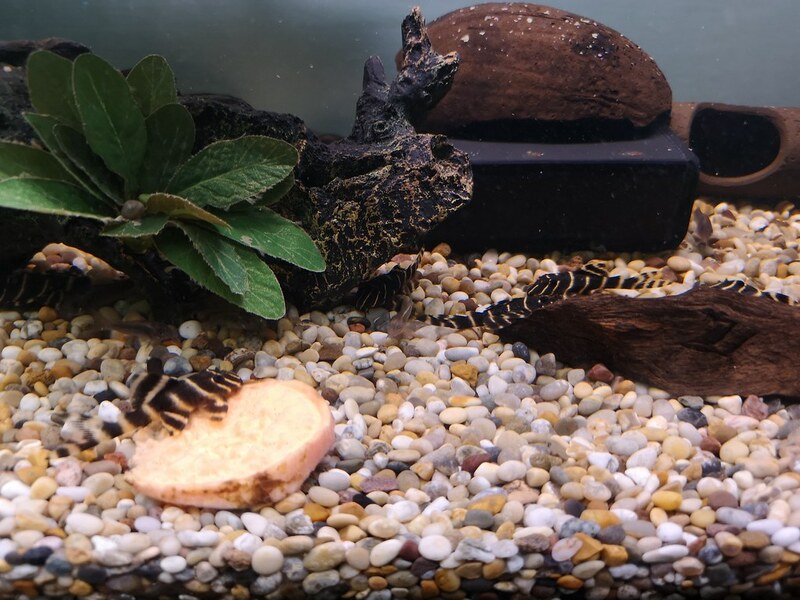 These fish were called leopard frog plecostomus, they are in fact a Peckoltia and have since been classified as Peckoltia compta L134 - this number is given when they are first discovered before a naming protocol has been given, these are one of my favourite fishes. A couple more shots.... all copyrighted to their respectful owners. 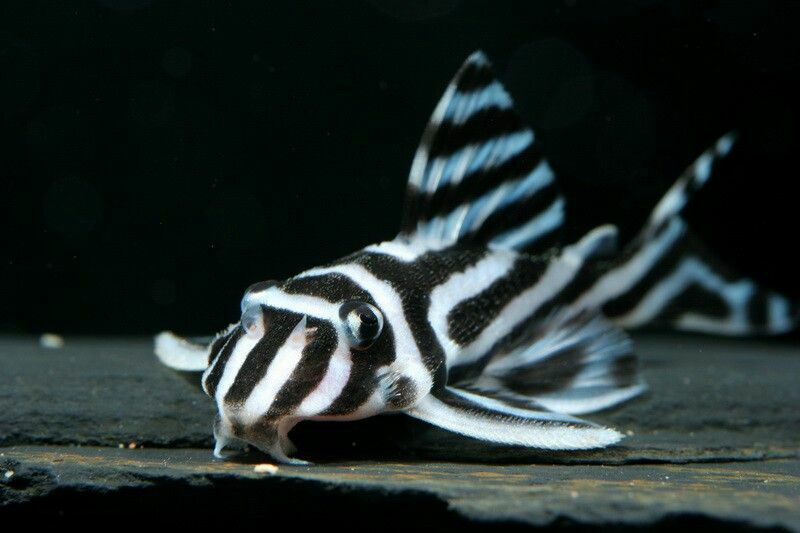 and this is truely a beautiful fish but unfortunately it will most likely be extinct in the wild due to the Brazilian government damming the only part of the river that these fish live and breed. they used to be found in amongst boulders upto 100feet deep in a stretch of the river Xingu, now the damming ( 300ft high damn wall )of this river has left the river to only a trickle and hardly 2 - 5 ft deep. 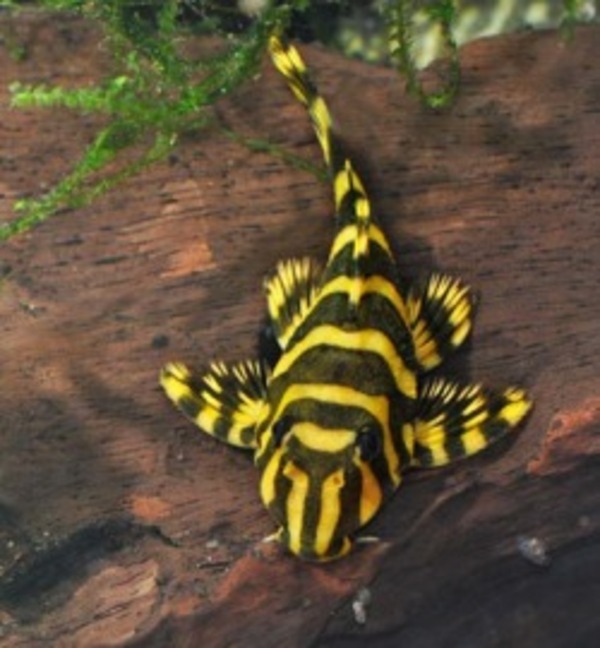 This is called a Zebra Plec L49, some say it is the prettiest fish in the whole world. 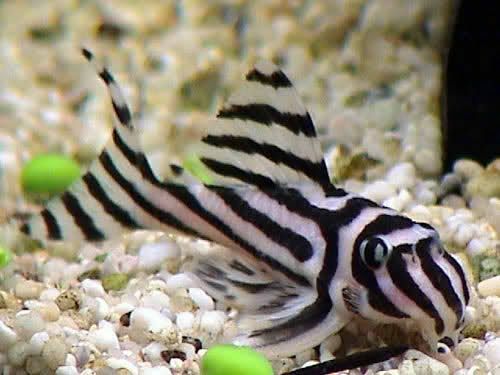 As a foot note Z'ers my name on this forum is Plecodoras, which is from the two species of fish I mainly breed - Plecostomus and Corydoras - hence Plecodoras !!! now you know !!! Cheers you can wake up now !! LOL..
you never know someone might have been interested. Some might say it's a bit like fig collecting or bush trimming, irrigation channels and the like.. get my mid rift ? There's been so little on the forum lately that a snap or two of paint drying would be welcome.